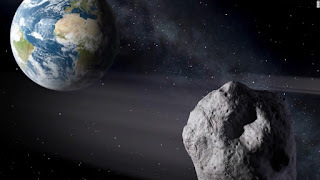 Asteroid 2014 J025, the largest asteroid to date to have ever approached Earth, passed the planet yesterday morning (19) at a distance of about 1.8 million kilometres, according to NASA. Although there was no possibility of the asteroid colliding with Earth, this was a very close approach for an asteroid of this size. It is roughly 2,000 feet (650 metres) in length and its surface is about twice as reflective as that of the moon. At this time very little else is known about the object's physical properties, even though its trajectory is well known. Smaller asteroids routinely make closer passes to Earth, but 2014 J025, discovered in May 2014, was the largest asteroid to come this near to the planet since 2004, flying by at only about 4/6 the distance from the Earth to the moon. Yesterday's encounter provided an outstanding opportunity to study this asteroid, and astronomers had planned to observe it with telescopes around the world to learn as much about it as possible. Radar observations were planned at NASA's Goldstone Solar System Radar in California and the National Science Foundation's Arecibo Observatory in Puerto Rico, and the resulting radar images could reveal surface details as small as a few metres.